The winter months can be a great time of year to take a road trip. National parks are less busy, campgrounds have more spots open, and gas prices tend to be lower. Sure, winter can bring ice and snow to roads, but with a little preparation and planning, you’ll find plenty of places to escape in an RV—even if you’re searching for sunshine. Here are some of our favorite road trips to take in the off-season. 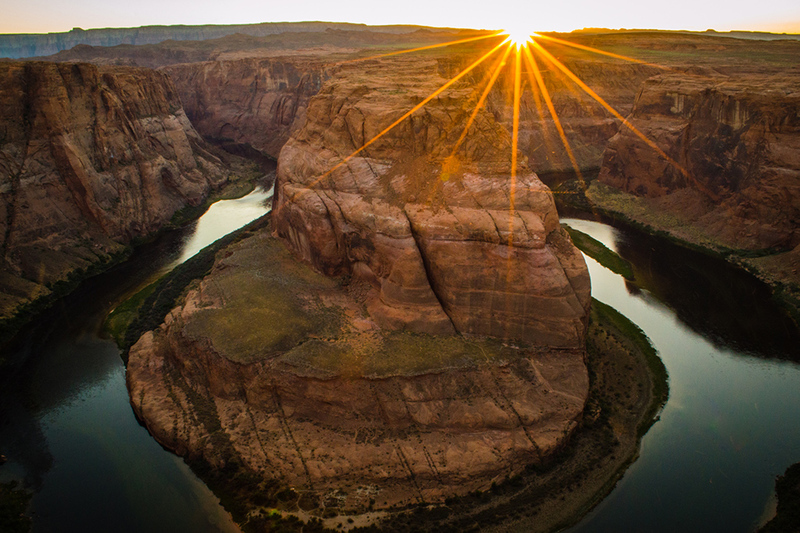 Horseshoe Bend in Page, Arizona. Pick up your Outdoorsy rental in Phoenix and head north to a land of cacti, red rocks, and unique canyons. Spend a few days exploring Sedona before heading to the South Rim of the Grand Canyon (where you may encounter snow) and then on to explore the natural beauty of Page. Be sure to stop for tacos at Joyride Taco House in Phoenix before hitting the road. Watch the sunset at Cathedral Rock in Sedona. This one-mile trail is a short, moderate hike up red rocks with expansive views of Sedona and the surrounding area. At the end of the trail, you reach a beautiful lookout that faces west, making it a perfect place to watch the sunset. Catch the sunrise at Mather Point on the South Rim of the Grand Canyon. Just past the Grand Canyon Visitor Center on the Rim Trail is Mather Point. Although it’s a popular area in the park, given its proximity to the visitor’s center parking lot, it’s an easy place to catch the sunrise and you won’t have to vie for a spot to look down at the canyon in the early morning hours. Tour Owl Canyon in Page, Arizona. Many tourists visit Page, Arizona to tour the slot canyons on the Navajo land. These canyons are well worth a visit, given their unique shapes, contours, and colors. Antelope Canyon (upper and lower) have become extremely popular over the past decade and you’ll most likely share your tour with dozens of other canyon-goers. It’s worth the extra time and money to visit some of the other canyons in the area, like Owl Canyon where you might catch a glimpse of a great horned owl and the crowds are much fewer. Pick up your Outdoorsy rental in Portland, Oregon and head west to Highway 101 for a scenic and winding drive down the Oregon Coast. You might encounter rain, but there’s no better place to watch a storm roll in, especially along the towering bluffs. Looking for some grab-and-go-grub before you kick off your trip? Portland is known for its food trucks so take your pick of breakfast, lunch or dinner options. Stroll Cannon Beach. This is a popular beach town on the northern Oregon coast with year-round activities. Visitors flock from near and far to stroll the sandy beach for views of Haystack Rock. Ecola State Park offers picnic sites and hiking trails (no overnight camping though) and beach-themed restaurants and shops dot the small town, making it a perfect long-weekend getaway. Explore around Hug Point. Evergreen tree-lined bluffs, sandstone caves and tidepools to explore make Hug Point State Recreation Site a perfect picnic spot on your trip down the coastline. Just five miles south of Cannon Beach, Hug Point features a seasonal waterfall, views of Haystack Rock to the north and an old stagecoach road to explore at low tide. Be cheesy at Tillamook Cheese Factory. No trip to the Oregon Coast is complete without a self-guided tour of the Tillamook Cheese Factory. The newly-remodeled creamery is open year-round in Tillamook, Oregon. Don’t miss their famous cheese curds and free cheese samples, and make sure to get a scoop of their decadent ice cream. Enjoy the views of Bandon By The Sea. Bandon is a quaint beach town on the southern Oregon Coast, home to classic golf courses, miles of sand dunes and cranberry bogs. 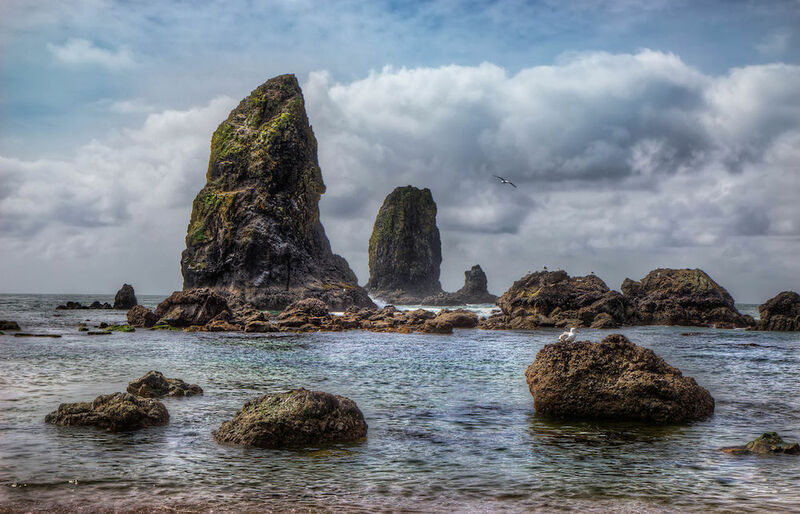 Don’t miss the Face Rock viewpoint for a glimpse of the towering sea stacks, the picturesque Coquille River Lighthouse, and a stroll along the Bandon Boardwalk. 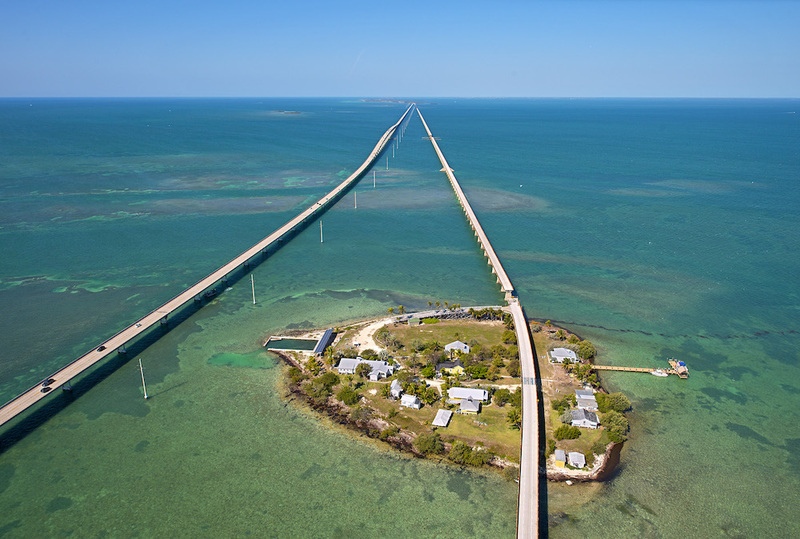 Pigeon Key and the Seven Mile Bridge. Photo by Andy Newman/Florida Keys News Bureau. What better way to spend the winter than soaking up the rays in the Florida Keys? Pick up your Outdoorsy rental in the Miami area and head south for the famous drive down U.S. Highway 1. The drive is one of the most scenic in America; you’ll cross 42 bridges on the Overseas Highway as you pass by tropical islands and expansive coral reefs. Snorkel and dive in Key Largo. 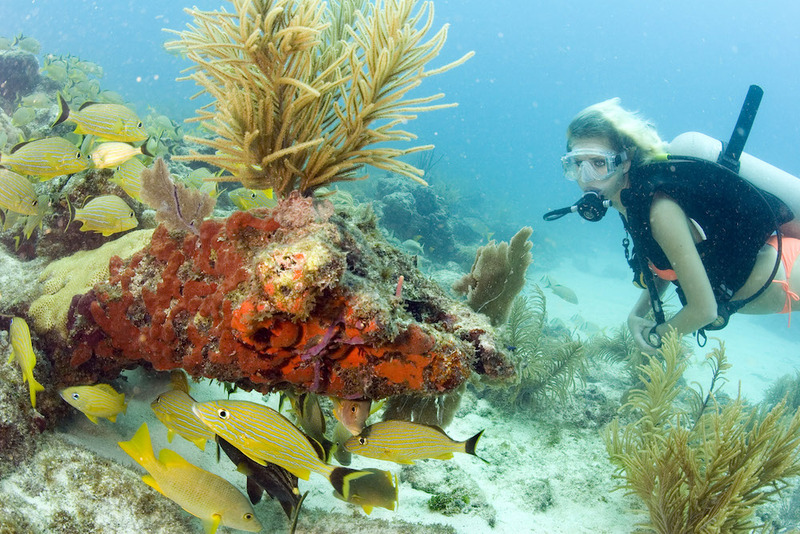 Take a snorkel or dive trip out to the Key Largo National Marine Sanctuary. You can explore shipwreck ruins, watch colorful schools of fish, and view the famous Christ of the Abyss in your underwater adventure. Camp and swim at Calusa Beach. This beach is located at Bahia Honda State Park, one of the best places to camp in the Keys. Because the beach is protected from the ocean winds, it’s a great place to swim, build sand castles or just be a beach bum for a day (or week). Watch the sunset in Key West. Enjoy happy hour at a tiki bar on the beach then walk Sunset Pier to watch the sun go down. Key West is known for its colorful architecture and spirited bars and cafes—make sure to try a Key Lime Pie martini! A diver explores the coral reef in the Florida Keys National Marine Sanctuary off Key Largo, Fla. Photo by Bob Care/Florida Keys News Bureau.